More than 15 million Nigerians chose Muhammadu Buhari as their president in 2019, close to the number that elected him in 2015, indicating that four years in office have not diminished his appeal. His power base lies with the poor of northern Nigeria, known as the "talakawa" in the Hausa language. In the last election, his nationwide appeal was boosted by the backing of prominent defectors from the then governing People's Democratic Party (PDP). This time round, his key asset is thought to have been his running mate, Yemi Osinbajo, a popular pastor from the largely Christian south of the country. In 2015, Mr Buhari was the opposition candidate, promising a clean break from the past. He had never been democratically elected despite having tried three times, and his public image - as a dour, incorruptible disciplinarian - was based on a 20-month stint as military leader, back in the 1980s. In 2019, Mr Buhari once again wielded his party's symbol - a broom - on the campaign trail. No longer representing a clean break from the past, this time he promised to take Nigeria to "the next level". His supporters can argue that his mandate was renewed because he had fulfilled previous campaign pledges, such as tackling corruption and cracking down on Boko Haram. However, his critics are likely to continue questioning his record in government, and his ability to deliver on any fresh promises. They will argue that the very attributes that won over voters in 2015 - Mr Buhari's strictness and inflexibility - have emerged as liabilities in office. They have already accused him of autocratic leanings as well as a disastrous tendency towards inaction. He took six months to appoint his first cabinet, earning himself the nickname, "Baba-Go-Slow". 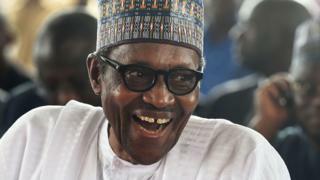 Mr Buhari's first term was also marked by intense speculation about his health. Since 2017, the president has often been away from Nigeria, receiving medical treatment. While the 76-year-old has refused to disclose the nature of his ailment, he was forced to deny that he had hired a body double to replace him at public events. The economy slid into recession during Mr Buhari's first term as president, dragged under by a sharp fall in the global price of oil. The downturn was exacerbated by his opposition to devaluing the naira, which led to a severe foreign currency shortage in the first year of his term. Companies that had to import goods and equipment were forced to rely on a black market in US dollars which had emerged to circumvent the fixed currency rate. Unemployment also doubled - a particularly troubling statistic in a country where two-thirds of the population live below the poverty line. As a result, many Nigerians would have looked back upon Mr Buhari's first presidential term as a time when their money worries intensified and their living standards took a hit. The lower voter turnout - even in his support base in the north - is perhaps an indication that some held him personally responsible for their hardship. Among other successes, Mr Buhari can point to some improvement in security in the north-east. Under his watch, the Nigerian military retook territory from Boko Haram militants that had been fighting to overthrow the government and create an Islamic state. Scores of schoolgirls that were part of a group of nearly 300 abducted by the militants were also reunited with their families. However, many of the so-called Chibok girls remain missing, and recent attacks by a Boko Haram faction have underscored the fragility of the security gains. According to Andrew Walker, a Nigeria analyst who has written a book about Boko Haram, the insurgent group has a record of using lulls in the fighting to regroup. "Mr Buhari was able to ride a period of low activity from Boko Haram, which now appears to be coming to an end," he says. Nigeria's security worries are not limited to the north-east. The impoverished north-western state of Zamfara has seen a sharp rise in kidnappings and killings linked to gangs of cattle rustlers, bandits and vigilantes. Mr Buhari's personal reputation for incorruptibility has survived his time in office - a rare feat among Nigerian leaders. However, he has been accused of using corruption investigations as a blunt instrument to neutralise his political opponents. In January 2019, Mr Buhari suspended Nigeria's chief justice, Walter Onnoghen, over his alleged failure to declare his personal assets before taking office in 2017. The timing of the move, weeks before the general election, provoked alarm. As the country's top law official, Judge Onnoghen would have played a vital role in overseeing potential electoral disputes. However, Mr Buhari dismissed concerns - voiced by foreign observers and opposition politicians - that the suspension had anything to do with the elections. Dissatisfaction with Mr Buhari's leadership has also rippled through the ranks of his party, the All Progressives Congress (APC). In 2018, the APC was weakened by a series of high-profile defections, with dozens of legislators crossing the floor to join the PDP. An early indication that all was not well came in 2016, when the first lady, Aisha Buhari, told the BBC's Hausa service that a small clique had hijacked her husband's administration, assuming responsibility for presidential appointments. Mr Buhari responded to the criticism by saying that his wife "belongs in the kitchen", which did his international reputation no favours. His regime is remembered for its campaign against indiscipline and corruption, as well as for its human rights abuses. Hundreds of people - including politicians, businessmen and journalists - were jailed under repressive laws. The regime also locked up the Nigerian musical legend and perennial government critic, Fela Kuti, on trumped-up charges relating to currency exports. The regime's curb on imports led to job losses and business closures, and a new currency was introduced in an effort to tackle corruption. Prices rose, living standards fell, and after 20 months, Mr Buhari was forced out by another coup, engineered by the army chief, Gen Ibrahim Babangida. Despite his professed conversion to democracy years later, Mr Buhari has always defended the 1983 coup, arguing that the military only stepped in when "the elected people had failed the country".